The computer and internet make for a very small world! Remember the blog I posted in January 2016, about my cousin and I spending the afternoon reading about our Great Grandfather, Fred Kiechel? Well, I find it more than coincidental that a distant relative's wife spent time reading my blog after randomly looking up to see what other information she could glean off the internet about her husband's Great Grandfather who happened to be the same Fred Kiechel that I wrote about. Shortly thereafter, she tracked me down and called me. I think I was as excited to hear from her as she was as excited to talk to me. Thus a new relationship was made, thanks to our common ancestor, Fred Kiechel! Her husband's grandfather was a brother to my grandmother and though their father, Fred Kiechel lived in Nebraska, my new relative and her husband and father-in-law now reside in Washington D.C. The internet and our ability to travel generations as well as miles with our finger-tips is indeed amazing! I had not been entirely accurate about Fred Kiechel and she added corrections. Fred Kiechel's father did die before his mother brought him and his two siblings to America, from Alsace Loraine, France and his mother later did remarry BUT Fred Kiechel was born Fred Kiechel and remained Fred Kiechel his whole life. 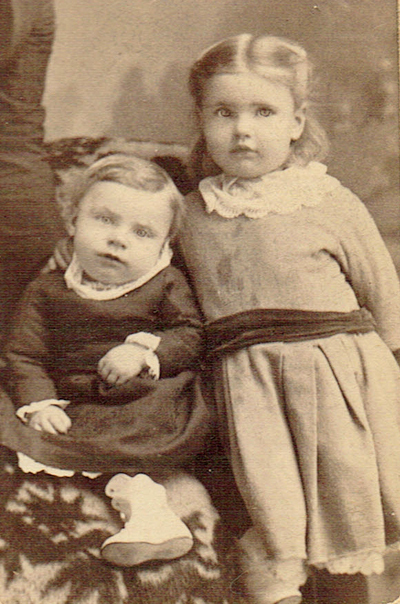 He was never adopted by his stepfather and the picture that I thought was an early picture of his wife, Alvina, and her brother, was more likely a picture of their second child, my grandmother, Addie Rose and her brother Walter, though that will hopefully be confirmed in the near future. Perhaps Addie Rose Kiechel, my Grandmother and her brother, Walter? 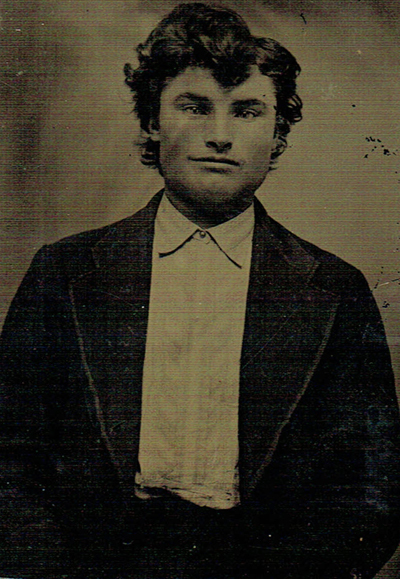 I gathered information to send to my new relatives, which included copies of my grandmother's diaries and copies of old pictures and family trees associated with Fred. I also sent a copy of a letter written by my grandmother's brother to her, along with the articles my Great Grandfather, Fred Kiechel had written for a local newspaper regarding some of the history of the area of Nebraska that he and his wife had helped settle. In the process of doing this, I learned even more about Fred. His mother had remarried and had several more children. She died shortly after birthing her last child, and knowing she would die, she requested that her first daughter raise this baby. Fred's step father quickly raced to town to get a marriage license to marry Fred's sister and while he was gone, she fled to the home of a young man she had been courting and they were married instead. Her stepfather, in anger, threw Fred and his brother out of the house and disinherited them. They then lived with their sister and her husband for a time! This would likely explain why Fred's grandson never heard him talk much about his mother! Fred's persona grew even bigger when I heard about this. His story is indeed a remarkable story of a young man who wasn't about to let personal loss and hard times stand in the way of his success! He indeed had much to be proud about as he reflected on his life and wrote his "not-so-humble account of it" that was later read by his son at he and his wife's 50th Wedding Anniversary celebration. The details of this glorious celebration and Fred's reflections were published in their local newspaper and was the article that my cousin and I spent the afternoon reading! Fred came alive again for a time. He was indeed a very colorful sort of personality! 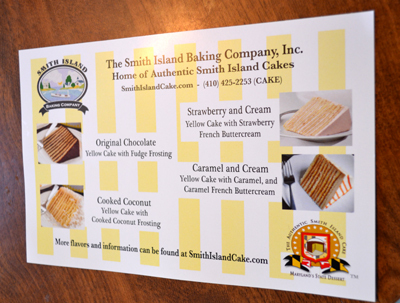 The varieties of Smith Island Cakes found at SmithIslandCake.com!! 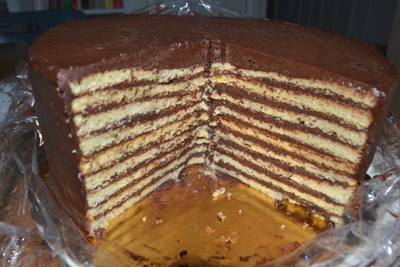 An Original Smith Island Cake for those with a serious sweet tooth! YUM!! I look forward to my new relative sharing any more information that she might glean from her father-in-law and his sister, the only two remaining relatives that I know of from my mother's generation. For my efforts in mailing the information that my father and my mother's cousin had gathered, I received a beautiful Smith Island Cake in the mail. I wrote to my relative that she had quickly become my "sweetest" relative ever for indeed this cake was made the way I like my cakes, half frosting/ half cake, and just like the fishermen that feasted on such a moist cake while at sea, we made it last as long as we could! My daughter, husband and myself were indeed well-paid for our efforts, besides which I have now dusted off my family's ancestry box. It is time to copy the family historical information for my siblings! I had been overwhelmed by this task, and it really wasn't so hard, as with computers I can now scan the pictures and other information and load it on DVD's and my mother's mother's side of the family is now done and ready to be sent to my own family members! I just need to do my mother's dad's side of the family and my father's side of the family! I also plan to post this information on ancestry.com so that other relatives may access this information as well. Perhaps I will meet more new relatives in the future, though to be sure, there will never be another relative as sweet, quite literally, as my Great Grandfather's Great Grandson's wife!! Shortly after confessing to her that I was at first reluctant to share this cake with my daughter and husband and considered hiding it in the freezer and keeping it all for myself, she emailed me back so say that she had ordered one of these cakes for herself, as her husband and son don't much care for sweets. My daughter and I are now convinced that she IS 100% blood relative, instead of her husband and their son!! 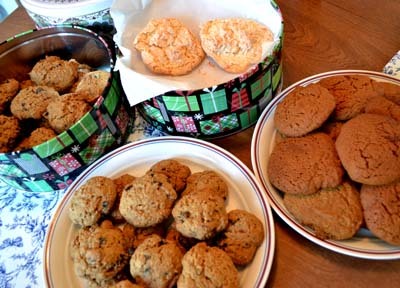 Cookies and Cakes make for healthy breakfasts! Martin Potato Salad does too! I inherited a sweet tooth from my mother and her sisters, and find it sad that my mother's correspondence with her sisters and mother wasn't saved, for they were hand-written letters loaded with new sweet recipes. We called them "Martin" letters, as they were all about Addie Rose Martin family gatherings and what was being served, along with recipes and snippets of materials with descriptions of new dresses and quilts in process! My new "sweet" relative fits right into our family!! I wonder if she knows anything about the yellow mustard potato salad family recipe that we credit to my grandmother's side of the family--perhaps it isn't really "Martin Potato Salad", but rather "Kiechel Potato Salad" instead?